What do you do when you can’t get a Yeti? Scour the earth for a quality alternative. That’s what led me to finding this great brand. I started asking around and found that many of my friends not only knew the Corkcicle brand, but owned a product and raved about it. “Love, love, love my Corkcicle.” Not only that, but they talked about it so much their friends have asked about them too. A two-time brand winner of Oprah’s favorite’s is proof this is a hot quality gift item. One thing I like about the Corkcicle tumbler is that the lid has a spill proof closure. Most other Yeti owners and I have all suffered from the inadvertent spill through the open hole on the Yeti lid, and despite requests for over a year, there’s still no updated lid version with a closure. 2016 REVIEW UPDATE: Yeti has announced a spill proof lid will be coming in 2016. The Yeti lid has a snugger fit than Corkcicle; you can hold a full Yeti tumbler by the lid, but not the Corkcicle (no reason you’d want to, but I tried anyway). UPDATE DECEMBER 2016. Yeti did not release the lid. Since Yeti only offers stainless steel, Corkcicle hands down has more color options, and cool variety of finishes. Like a car, the finish can be scratched, but as a marketer, I prefer color to stainless for branding. 2016 REVIEW UPDATE: Corkcicle, with it’s triple wall insulation, is a worthy competitor in maintaining cold liquids. Both brands claim to keep drinks cold twice as long as plastic tumblers. In my unscientific testing, Corkcicle stayed cold longer! The test: Ran the tap water a bit. Added 1 cup of tap water each to the Yeti 30 oz and the Corkcickle 24 oz. Added 1 cup of ice cubes to each. Put the lid on. Interior home temperature 75. Yeti ice was melted 18 hours later. Corkcickle was melted 22 hours later. You could run this test and get different results. Both excel at keeping drinks cold. I didn’t run any tests to compare. Presumably, they’ll both excel due to the insulation construction. 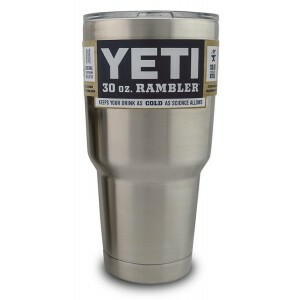 Yeti Rambler Tumbler comes in 20 oz and 30 oz sizes. 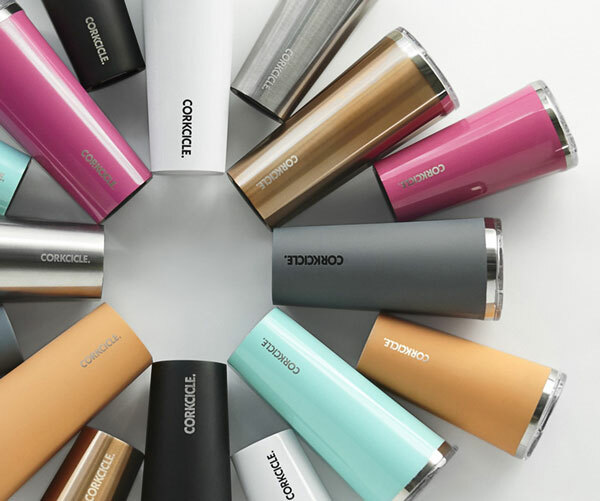 Corkcicle Tumbler comes in 16 oz and 24 oz sizes. If you’re a power drinker like me, get the bigger size of either brand. I started with the 30 oz Yeti. My hands are not that big, so when full, it was kind of heavy if holding onto for any length of time. I now use the 24 oz Corkcicle almost exclusively and it’s plenty big enough for me. Both manufacturers require authorized resellers to abide by strict pricing rules, including no advertising below Manufacter Suggested Retail Price (MSRP). The Corkcicle Waterman collection sells at a $3 premium. MSRP is for blank units without logo. Ask us about free logo imprinting, set up fees, and free shipping. For stainless steel only, the options are basically the same. Using a laser, shades of grey to black can be achieved for a permanent etch. For color tumblers, the color is removed with the laser to create a contrast between tumbler color and stainless below. Corkcicle also offers a 4 color logo option. From the Corkcicle non-slip bottom to keep it from from sliding, to the choice of colors, there’s a lot to like. For large orders, we can even custom manufacturer your own color. Are there other tumblers with spill proof lids and colors? Yes, and I’ve tried several of them. They didn’t match up for a variety of reasons. I would not hesitate to buy Corkcicle’s instead of Yeti for your custom logo tumblers. I’m so happy I found this brand. We offer the entire line of products to our corporate clients as a great gift item. Click here for the entire Corksicle catalog. Click here for select Corkcicle items online for immediate purchase. For our Texas customers that only buy Yeti tumblers, an alternative popular item is the Corkcicle Whiskey Wedge. i would like to order some corkcicle tumblers in gray with my logo on it. what would be price shipped to san angelo tx for 30/ 50 tumblers? What size tumbler? When do you need in hand? The 24 oz is $34.95 and includes standard shipping. 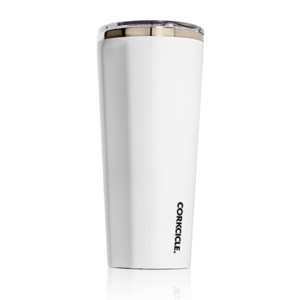 Click here to buy custom logo Corkcicle grey tumbler now. Please note, we have a 48 minimum order, and increments of 18. I would be interested in knowing if you could fulfill an order of around 200 of the 24 ounce tumblers with a logo on them. Yes, we can. Contact me for details and in-hand date requirements.